Many of you know that discussions are underway in several communities within DeKalb County regarding the possible creation of new cities. As the creation of cities is a legislative process, my colleague Rep. Mary Margaret Oliver will be chairing a town hall meeting on the topic this coming Monday evening, May 6th. I will be attending along with my fellow legislators and County Commissioners. Representatives of neighborhoods and citizen groups that have held discussions regarding cityhood will briefly describe their efforts. Please see the official meeting invitation below. Members of the DeKalb House and Senate delegations, including those who have introduced legislation to create new cities or annex new areas to existing cities, will hold a Town Hall meeting on May 6, from 6:30 pm to 8:30 pm at Clairmont Hills Baptist Church, 1995 Clairmont Road, Decatur 30033, the corner of Clairmont and North Druid Hills Road. We want all DeKalb citizens to learn about the options available to them for local governance, and how you may participate in the efforts that will be on-going this summer. PLEASE JOIN US! HB 22-Primary Sponsor Mary Margaret Oliver. HB 22 sets out additional procedures and enhanced financial requirements for creation of new cities. HB 665—Primary Sponsor Mary Margaret Oliver. 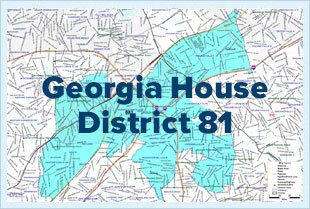 HB 665 is a placeholder bill to create new city of Briarcliff/Druid Hills. HB 687-Primary Sponsor Pam Stephenson. HB 687 limits the ability to annex new areas to existing cities by geography. SB 278-Primary Sponsor Ron Ramsey. SB 278 would create new city of Stonecrest.